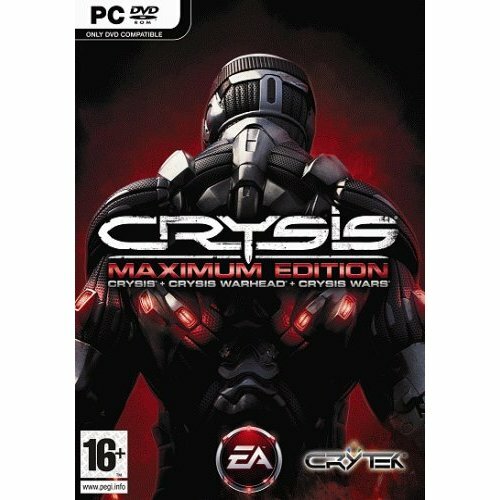 Buy Crysis: Maximum Edition for PC in India at the best price. Screenshots, videos, reviews available. Finally, gamers can get their hands on the entire Crysis world in Crysis Maximum Edition. The 2007 PC Game of the Year is packaged along with the critically acclaimed parallel story, Crysis Warhead, and the explosive multiplayer combat of Crysis Wars.For newcomers to the Crysis world, Crysis Maximum Edition gives players chance to don the Nanosuit in three different games for one low price. Whether they’re saving mankind from an alien apocalypse or fighting alongside friends in online team instant action matches, there is something for everyone in Crysis Maximum Edition. Confront an ancient alien terror to save mankind from extinction. Adapt your approach- change combat tactics by customizing your Nanosuit in real time. Fight as the volatile Sergeant Sykes on a secret mission to stop the enemy from obtaining a weapon that threatens humanity. Discover what happened on the other side of the island in a campaign that takes place at the same time as the events of Crysis. Never play the same way twice- experiment with going stealth or with guns blazing in over-the-top action. Engage in many explosive multiplayer game modes on 21 total maps. Up to 32 players can battle it out on foot or by vehicle in Team Instant Action, Power Struggle, and other online game modes. Crytek had generated huge expectations with this game - but I think Crysis clearly falls short by 50% from the bar it had set with Farcry and 90% from the hoopla it had created for Crysis. Maybe Crytek should outsource production given the dismal game design, which makes me feel that Farcry's success was due to Ubisoft's production and not because of Crytek's technical ingenuity. I don't know what to do with Warhead - will revisit when I have nothing to play - heard its a five hour game. You are a nanosuit warrior against the bad KPA and some surprisingly different extra terrestrials. Apart from this being one of the best games, its a great compilation. Both Crysis and Warhead are amazing with their original story. There's not a great array of weapons but still good. The graphics provide a lot of eye candy and the gameplay is fun. If you own a high end gaming rig - you are in for a treat. Graphics: 10/10.`AI: 7/10. Story: 9/10. Overall: 9/10. This is the most comprehensive collection of Crysis ever! Had been waiting for my copy for a long time and when I got it, I was over the moon! The graphics are too good and remind one of the first Crytek game Farcry. An excellent game and a must for FPS enthusiasts. Crysis is the best looking game made for PC ever. And that is all you need to know for a start. Now comes the part about its amazingly sophisticated and polished sandbox style gameplay mixing FPS and stealth mechanics. The island where the games take place is an amazingly beautiful place and rendered to perfection with mindblowing visual and physics effects. The player and enemy characters and vehicles are perfectly rendered also. Altough the storyline is a bit predictable and cliched,this game is a technological marvel and one of those titles that every games worth his or her salt must play. Truly a classic, a gamechanger like Doom, Quake, Half-Life, Portal and so on. So this game is in good company.